Blue skies and bright sunshine greeted more than 3,000 people who attended Arden’s First Neighborhood Opening on Saturday, April 29. 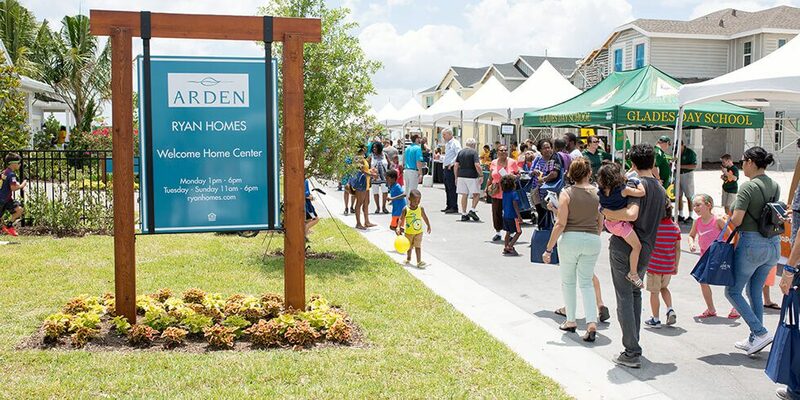 After two years of planning, site preparation, landscaping and construction, the spectacular new master-planned community on Southern Boulevard in western Palm Beach County celebrated its opening milestone with a family-friendly event featuring tours of the recently completed models by Ryan Homes and fun for everyone. The lineup of entertainment included animal encounters from nearby Lion Country Safari, music provided by 103.1 WIRK Country, bounce houses, face painting, a Home Depot kids workshop, prize giveaways, complimentary Chick-fil-A, Kona Ice, and so much more. Developed by Freehold Communities, Arden will eventually include 2,000 homes—the majority of which will back up to a community open space, including parks, playfields, greenways, nature trails or lakes. Purposefully designed to magnify the connection between nature, health and happiness, the scenic property features 20 miles of walking and biking trails; a central mile-long lake for fishing, kayaking or canoeing; and expansive great lawns for events. Arden is one of the first in Florida to feature a farm as a central component of community life. The five-acre parcel will produce fruits, vegetables and herbs under the guidance of a Farm Manager, and feature an event barn where residents can gather for seasonal themed classes, harvest experiences, and more. The gracious two-story Clubhouse will form the heart of recreational activity at Arden. A resort-style pool flows over two levels. The peaceful upper pool and spa are surrounded by private cabanas for those who want some quiet time, while the lower pool offers water play areas perfectly suited for families. The Clubhouse will offer plenty of separate indoor and outdoor gathering spaces for all ages to enjoy. The upper level will have an inviting Wi-Fi café serving coffees, lattes, juice and grab-and-go food items, including frozen treats; meeting and event rooms; and an outdoor covered patio with a fireplace. The lower level will include a large fitness room and a private exercise studio with Wellbeats™ virtual trainers on demand. Ryan Homes, one of the builders featured in the community, has models now open and is offering eight home types in an array of styles and price points. Tours are available from 1:00 to 6:00 p.m. on Mondays and 11:00 a.m. to 6:00 p.m. Tuesday through Sunday.